Kadhis (yogurt curry) is made in numerous ways all over India.Some make kadhi thin, some make it thick. Some add pakoras(fritters) and some add vegetables to it. Whichever type it is I simply love kadhi with rice, parathas or rotlis. Years back when we discovered that my husband developed an allergy to chana (chickpeas), he was disappointed as he was unable to have a variety of foods. Its amazing how many things are made of chickpea flour. Initially whenever we made kadhi at home, we would make some dal for him. But obviously he missed his kadhi. One day my father in law remembered that when he was growing up in the village in India, his mum would make kadhi using millet flour (bajri) as most villagers could not afford to buy besan or chana(chickpea). Chickpea flour was used only for special days and during the festival. So Nunu made kadhi with millet flour. After a lot of trial and error we got it right. Now, whenever I make kadhi, I use either millet or moong flour. Kadhi made with millet flour, tastes slightly different from the one made with besan but most of my guests cannot make out the difference. A great way to make all sorts of kadhis especially for those who are allergic to chickpea. 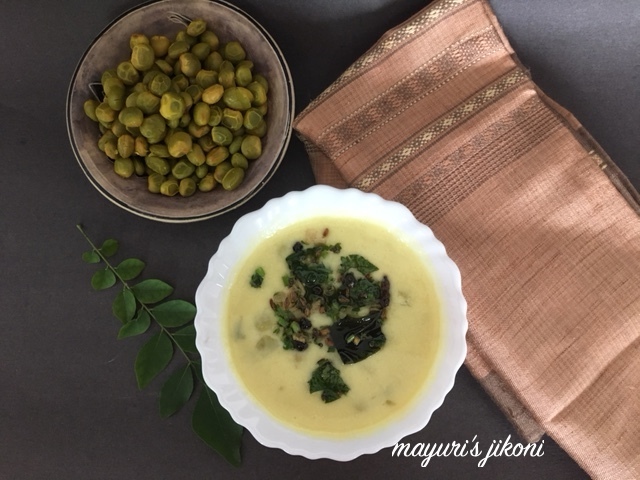 At the moment we still get quite a bit of fresh tuvar (pigeon peas) and I remembered that my mum would quite often add the more mature or yellow tuvar into the kadhi. Tastes absolutely yummy and you can make it into a wholesome meal with parathas, rotis or rice. Put the fresh tuvar,1½ cups of water, salt and turmeric powder in the pressure cooker. Let the tuvar cook for 1 whistle. If you do not have a pressure cooker then just boil the tuvar in a pan till its done. Put yogurt, water and millet flour in a deep saucepan and whisk it till there are no lumps left. Add ginger and chilli paste along with the methi and gur. Mash the tuvar lightly, not too much. Add the cooked tuvar along with the water to the yogurt mixture. Put the saucepan over medium heat and keep on stirring the mixture till it becomes hot and starts becoming thick and creamy. This will take about 10-15 minutes. Let the kadhi simmer over low heat for a further 5 minutes. Heat ghee in a small saucepan. When it becomes hot, first add methi,cloves, cinnamon and peppercorns. When it begins to sizzle add mustard seeds and cumin seeds. Next add the garlic and asafoetida. Stir fry till the garlic becomes light pink. Add curry leaves and coriander. Mix and add the tempered mixture into the kadhi. Serve kadhi with rice, parathas or rotis. If the kadhi appears very thick before serving, just add a little water to it. Can add chopped green chillis to the tempering. Sour yogurt makes the kadhi taste better. Keep the yogurt out of the fridge overnight to make it a bit sour. Can use chickpea flour instead of millet flour. Initially use 4 tbsp only.